I've been dabbling with various psychic loadouts for the Thousand Sons, and one that sort of appeals is Malefic Daemonology - if they're gonna be portrayed as traitors and heretics, may as well go full bore! My hope is that when the Prospero book is released they'll come out with tutelary models but in the meantime it's just good old fashioned daemons of Tzeentch The Primordial Creator - The Primaris power grants either a 10-strong unit of Pink Horrors or 3 Flamers, and as I am really not a fan of the new plastic Horrors (and haven't had much luck finding the old metal ones for a non-exorbitant price), a trio of Flamers it is! ...Not a hardship, I love the new plastic Flamer models! 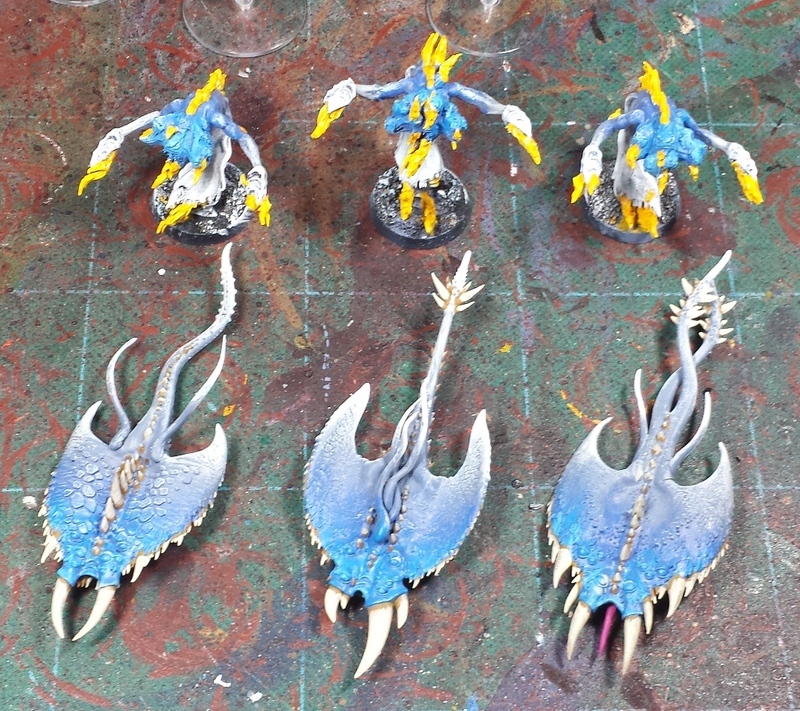 The Incursion power summons 3 Screamers, which I had on hand from the stalled Tzeentch Renegades 40k army. Easy peasy! I've had a box of the new Flamers and Screamers lurking in the Closet of Doom for ages, so after a quick delve and build session, I set to painting 'em up! Started off with a basecoat of Vallejo Shadow Grey. Once that was on, I tried my hand at a blend to blue in one direction and to white in the other, so the whole model ended up with a cool-toned blue-to-white transition. ...And a lot of paint on my fingers! Next was blocking in the details which helps to clean up a lot of the slop from the blending stage. Base of golden yellow over white for the flames, and bone white over leather brown for the teeth and spikes. After that it was time to work on the two units separately - the flames on the Flamers got a drybrush of hot orange, followed by red gore on the very tips. The teeth were done up in the leather brown and bonewhite as they were on the Screamers, and I tried to pick out the eyes in white as well - I'm not entirely happy with it though. Might go with a violet or possibly yellow (though that might just end up looking like more flames). Quite happy with the screamers - the fade worked rather well, and the yellow eyes ended up suitably creepy! 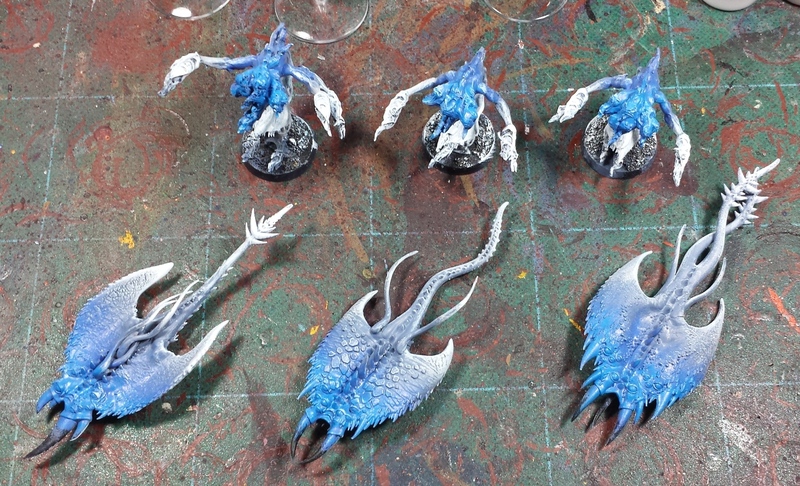 Beyond these critters it looks like there's a need to build a herald for the Sacrifice power, thinking I may use the Blue Scribes model that I have for that - alternately I might opt pick up the Changeling model, I've always wanted to paint one! Finally the Possession power requires there to be a Lord of Change in the mix - I have an old metal one from waaaaaaay back in the day that I'm considering repainting, but I'm hearing rumours that we may be seeing a new plastic model which would be fantastic. Alternately I'm thinking that a plastic daemon prince kitted out as though the sorcerer suffered a particularly bad case of the Flesh Change could work too! 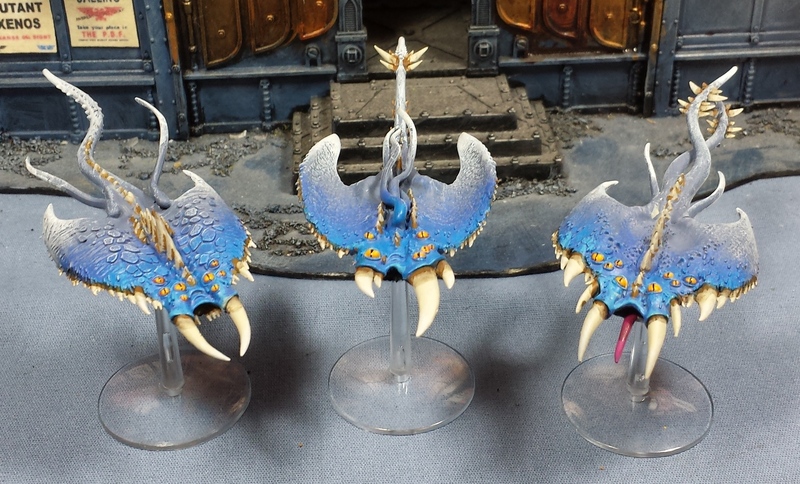 nice work on those screamers! 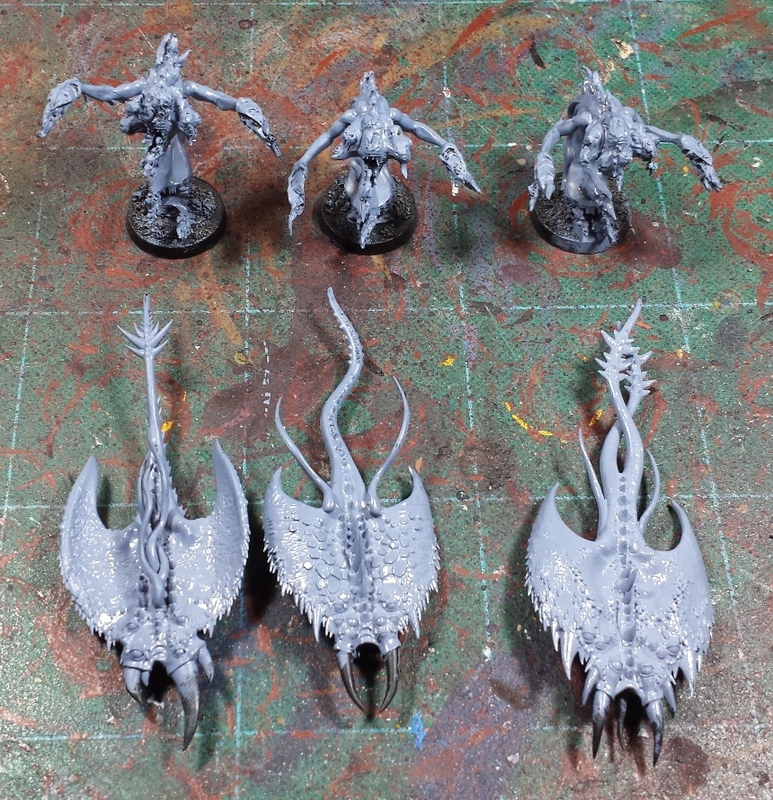 The screamers are the stand out there (while your flamers are fine I'm not a fan of the model). Lovely work on the fade out and those eyes are very cool. Love the fluff with these, nice job! 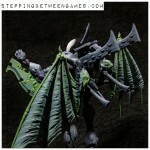 Might have to snag a Greater Daemon when they finally drop. Ah man looks great. Such a joy to see and read your blog. You've got some amazing talent, but still manage to come off as humble. Kinda the opposite of some other blogs I've seen, that have talent but generally come off as pompous (like Dave Taylor's blog) Anyway keep up the good work, man. You're great. Nice work. The blue/white turned out sweet. @Zab: Thanks very much! Very fun to just paint some bizarre critters as a quick change of pace! @Frothing Muppet: Cheers! They're my favorite of the two as well! @Jugger: Thanks bud! I would love to see a new Lord of Change, the current model (as cool as it is) hasn't been updated in 10+ years. @Eater of Small Things: Thanks very much, man - I just paint for the joy of it, and I'm always jazzed when people can take some enjoyment from it too. I got a chance to meet Dave and hang out with him for an afternoon at Gencon and can assure you he's a great guy! @TheAmbit: I appreciate it! Was interesting to try out the blend starting with the middle color and working outwards, definitely going to be trying it again on the Herald and Lord of Change!